I thought it might be useful to round up what some of the experts and military leaders have said during the most recent New START hearings in the Senate Foreign Relations Committee, as well as the Senate Armed Services Committee. On Wednesday, June 16, 2010, the Senate Foreign Relations Committee heard testimony from General Kevin P. Chilton, USAF, Commander of United States Strategic Command, as well as Lieutenant General Patrick J. O’Reilly, who is Director of the Missile Defense Agency. Here are some excerpts from the transcript. 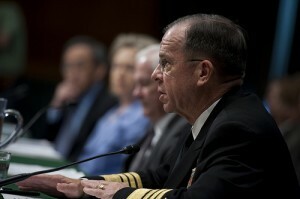 The Senate Armed Services committee received testimony on New START yesterday, June 17, 2010. Testifying were Admiral Mike Mullen, Chairman of the Joint Chiefs of Staff, Secretary of State Hillary Clinton, Secretary of Defense Robert Gates, and Secretary of Energy, Steven Chu. Here are some excerpts from the hearing. First, the treaty will not constrain the United States from deploying the most effective missile defenses possible, nor impose additional costs or barriers on those defenses. I remain confident in the U.S. missile defense program, which has made considerable advancements, including the testing and development of the SM-3 missile, which we will deploy in Europe. In my view, a key contribution of this treaty is its provision for a strong verification regime. I would close with a final observation. I first began working on strategic arms control with the Russians in 1970, 40 years ago, a U.S. effort that led to the first strategic arms limitation agreement with Moscow two years later. The key question then and in the decades since has always been the same: is the United States better off with a strategic arms agreement with the Russians, or without it? The answer for successive presidents of both parties has always been, with an agreement. The U.S. Senate has always agreed, approving each treaty by lopsided bipartisan margins. The same answer holds true for New START. The U.S. is better off with this treaty than without it, and I am confident that it is the right agreement for today and for the future. It increases stability and predictability, allows us to sustain a strong nuclear triad, and preserves our flexibility to deploy the nuclear and non-nuclear capabilities needed for effective deterrence and defense. In light of all these factors, I urge the Senate to give its advice and consent to ratification on the new treaty. … In summary, this New START agreement is important in itself, and should also be viewed in wider context. It makes meaningful reductions in the U.S. and Russian strategic nuclear arsenals while strengthening strategic stability and U.S. national security. Coupled with the administration’s clear commitment to prudently invest in our aging nuclear infrastructure and in nuclear warhead life extension programs, this treaty is a very meaningful step forward. I encourage the Senate to fully study the treaty. I believe you will see the wisdom of ratifying it, and I sit before you today recommending that you do so. I know that some argue we don’t need the New START Treaty. But let’s be clear about the choice before us. It is between this treaty and no legal obligation for Russia to keep its strategic nuclear forces below an agreed level, and between this treaty and no on-the-ground verification of Russia’s strategic forces. [T]he New START Treaty does not restrict our ability to modernize our nuclear weapons complex to maintain a safe, secure, and effective deterrent. As Secretary Chu will discuss, this Administration has called for a 10-percent increase in FY 11 for overall weapons and infrastructure activities, and a 25-percent increase in direct stockpile work. During the next ten years, this Administration proposes investing $80 billion in our nuclear weapons complex. Hopefully they’ll take into account the testimony given during all of these hearings, and put politics aside in the interest of national security and international stability. This entry was posted in New START, Nuclear Weapons and tagged New START, Nuclear Weapons, Senate Armed Services Committee, Senate Foreign Relations Committee, Strategic Arms Reduction Treaty. Bookmark the permalink. Post a comment or leave a trackback: Trackback URL.